Our community has 3,117 members, 105 online now. We’ve published 9,772 stories, shared 8,322 images, made 10,347 blog posts and written 121,506 forum posts. When I was twenty years old my grandfather was diagnosed with pancreatic cancer. He passed before I turned twenty-one. In all my years leading up to that day no one ever sat me down and taught me how to deal with the pain of loss. There were no classes in school. My mom never explained how it would feel, or how to cope with that pit in your stomach. It was just one of those things I had to figure out on my own. One of the many pangs of growing up, I suppose. This is my story. Your interest in reading it will be somewhat cathartic for me. It is a true story. It was a regular southern California afternoon, sunny and seventy degrees. The weather was typical but the day was anything but; it was the day of my grandfather’s burial service. I had hoped it would rain so tears would be indistinguishable, but it hardly ever rains in southern California. The glaring sun did allow me to wear sunglasses which would act as a veil. But, to be frank, by that point I probably cried out every tear I had. I was raised by a single mother, along with a revolving door of nannies; not their fault really, let’s just say I was a bit of an energetic child. The closest thing I had to a father figure was my grandpa. He was an amazing man. Started his own law firm early in his career and through intelligence and perseverance, grew it into a rather large and thriving practice. He taught me most of the valuable lessons where my mom, being my mom, just wasn’t able to. The one lesson he did not and could not teach was how to continue down my path without physically being able to reach out to him. That was the thought. The thought that spun in my head as I sat there on that cemetery lawn staring blankly at his casket. The thought of permanence. Never again would I hear his voice. Never again feel his soothing embrace when I needed that big papa bear hug. As the thought wretched its way through my brain, I felt my fingers begin to numb and my vision start to tunnel. The voice of the preacher droning on about the afterlife faded away until it was just imperceptible noise. My heart pounded in my chest as if it was on the verge of racing uncontrollably. So there I was, on the precipice of a panic attack at my grandpa’s ceremony. I was supposed to be saying my goodbyes, remembering good times, listening to how I will see him again in some mysterious form in some mysterious place. Instead, I was pleading with my mind to spare us the embarrassment of losing it. I don’t remember what made me turn my head and direct my blurred vision to a flower arrangement that sat atop his casket, but I did. There, sitting on one of the flowers was a beautiful, vibrantly colored butterfly. It seemingly stared back at me. I was mesmerized by it. The delicate curve of its wings. Each were dappled with stained glass-like panels, colored with the orange and red hues of a breathtaking sunset and framed in a rich black outline. When it held them closed they flawlessly matched up as if they were cut with the precision of a laser. It wasn’t moving, apart from a slow and methodical open and close of its wings. Not fully, just a small open, then a draw to pull them back together. I found myself timing my breathing to this motion. Inhale as they opened. Exhale as they drew back closed. Soon my heart joined in, and the numbness began to wash away from my fingers. My vision returned to normal and I once again heard the shuffle of people around me. 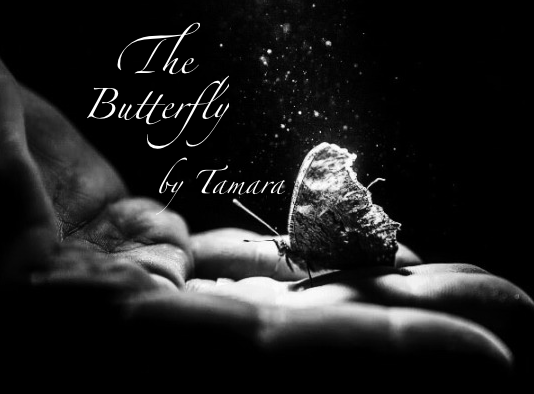 That little butterfly, with its slight and fragile wings, had picked me up and floated me down from the edge I was teetering on. My grandma was first to kneel by his side. When she was finished, my mom and I were motioned up for our moment. As I approached I noticed the butterfly was no longer perched on that bed of flowers. I bowed down, kissed the cold box that held him inside and by some miracle found a hidden cache of tears that even my oversized sunglasses couldn’t shield from view. Through the sobs, I promised to make him proud and continue down the path he laid out for me. I said goodbye, ran my fingers over the gorgeous arrangement of flowers and thanked him for saying goodbye to me too. In that moment I learned a lesson that cannot be taught by any loving parent, or even the brightest professors in the world. I learned that even in the heaviest of losses they may be gone but they never truly leave. That permanence I so desperately tried to hold on to did not slip through my grip, it merely morphed from one form into another. I now see butterflies everywhere I look. Allow your mind to embrace that metamorphosis and I promise your heart will see them too. Copyright © Thought of and written by me. Do not copy or re-post without my permission.